We’d love your help. 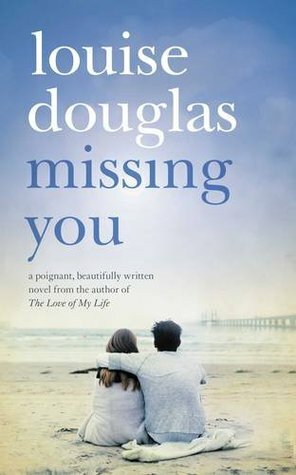 Let us know what’s wrong with this preview of Missing You by Louise Douglas. To ask other readers questions about Missing You, please sign up. 'Missing You' is a well-written, beautiful, heart-warming story that really had me captivated from start to finish; not a light chick-lit read, but definitely one worth picking up. I read and adored Louise Douglas' debut novel, The Love Of My Life and so when I saw she had a new book coming out this month, it went straight to the top of my wish list. I wasn't disappointed, as again Douglas delivers a story that will take you on an emotional roller coaster and keep you completely absorbed. The development of the relationship between Fen and Sean is stunning, but what I really loved reading was the relationship between Sean and his daughter Amy. She is only six when her pare I read and adored Louise Douglas' debut novel, The Love Of My Life and so when I saw she had a new book coming out this month, it went straight to the top of my wish list. I wasn't disappointed, as again Douglas delivers a story that will take you on an emotional roller coaster and keep you completely absorbed. The development of the relationship between Fen and Sean is stunning, but what I really loved reading was the relationship between Sean and his daughter Amy. She is only six when her parents separate and struggles to understand it. Sean also struggles to adapt to the new relationship with his daughter, fighting against the resentment and anger he feels for his wife and his determination to protect his child. I've read countless books on relationship break ups from a woman's perspective, but can't think of many that are from a man's. I think Louise Douglas handled this beautifully and sensitively; the feelings and emotions Sean goes through are so vivid. I admit to feeling that I wanted to protect him myself, maybe even falling a little bit in love with him. I won't give you a synopsis of the book, many have done that. I was kinda hesitant to write a negative review on this book because most people that have read it have thought it good. OK, I do have to warn I am 15 so that is probably why my opinion defers considerably. The first thing I noticed was the lack of imagery, not the garden, we had lots of description of the garden but the people themselves. At the end of the book I had no idea what Sean looks like or Fen, in fact. It's not that I have I won't give you a synopsis of the book, many have done that. I was kinda hesitant to write a negative review on this book because most people that have read it have thought it good. OK, I do have to warn I am 15 so that is probably why my opinion defers considerably. The first thing I noticed was the lack of imagery, not the garden, we had lots of description of the garden but the people themselves. At the end of the book I had no idea what Sean looks like or Fen, in fact. It's not that I have no imagination it's just that there was nothing there to really go on. All I know was that Fen was "slight", as Sean repetitively said. To be fair we did get hair colours dotted here and there but, for me, it certainly didn't suffice. The way in which it was written really got on my nerves, 'Fen looked up' 'Fen did this'. OK, maybe they aren't direct quotes but you get the picture. It did have a simple flowing structure to it which I did enjoy, the books isn't all bad, not even close. Also, I seemed to be the only one who has picked up on this but there seemed to be no time structure. The only time I knew the date or round about was because of seasonal happenings e.g. Christmas. The book tended to skip days or even moths and left the reader with no idea. The secret she was hiding was such a anti-climax. I don't want to say too much in case anyone hasn't read this yet but it just felt a bit ridiculous. I know I can't empathise with the situations she's been in but it Fen certainly made it sound worse then it actually was. I am capable of emotions, just in case there is any question of that but I just felt no emotional attachment to the book. It failed to draw me in. Having left my kindle unsecured, I returned home to see that my son had managed to buy this book. Unfortunately, I'm not very impressed with his taste in books. The plot is not only obvious from almost the end of the first chapter, but the main female character - Fen - is remarkably annoying, always questioning herself and what others are thinking of her. Unfortunately, there is a flashback scene where she is at a festival that shows her as a remarkably different type of person - there is a plot Having left my kindle unsecured, I returned home to see that my son had managed to buy this book. Unfortunately, I'm not very impressed with his taste in books. The plot is not only obvious from almost the end of the first chapter, but the main female character - Fen - is remarkably annoying, always questioning herself and what others are thinking of her. Unfortunately, there is a flashback scene where she is at a festival that shows her as a remarkably different type of person - there is a plot reason as to why she is always questioning herself, but as far as I can work out, the festival scene came later than the plot point, so it doesn't really ring true. The main male character - Sean - has two annoying characteristics. Firstly, he doesn't seem capable of working out what will obviously make his family and Fen happier, but needs it spelled out to him by his sister. The problem is that it is so blindlingly obvious you almost want to hit him. The second problem is the author's habit of thinking that music somehow equals characterisation. Sean is upset - listens to Massive Attack loudly in the car. This meant to make me relate to him but just sticks out like a sore thumb the more it occurs. Fen, a single mum to her son Connor carries a secret with her. A secret that clouds her life. Sean finds himself single again after his wifes affair, and moves into Fens house as a lodger. Their friendship slowly turns into something more, but past and present events conspire to keep them apart. Another excellent read from Louise Douglas. I adore her style of writing, there is just the right amount of beautiful description to have you thoroughly engrossed in the place or person she is portraying Fen, a single mum to her son Connor carries a secret with her. A secret that clouds her life. Sean finds himself single again after his wifes affair, and moves into Fens house as a lodger. Their friendship slowly turns into something more, but past and present events conspire to keep them apart. Another excellent read from Louise Douglas. I adore her style of writing, there is just the right amount of beautiful description to have you thoroughly engrossed in the place or person she is portraying. This story builds up nicely, and has a great cast of characters. I have had this book on my kindle since I first was bought it back in 2013. Finally decided to read some books that have been waiting for quite some time. This story was enjoyable, sometimes I found it a bit predictable. Also there were a few times within the book that swearing was involved within the text. In my opinion swearing is unnecessary and doesn't add anything to a story. Although the swearing was brief and the reader was able to skip over it. İlk defa okudugum bir yazar cok sevimli bir hikaye idi..Tavsiye ederim. Sean is having a bad week. His wife not only kicked him to the curb, she did so because she is having an affair with her older professor. Out Sean goes, leaving behind his beloved daughter and the woman he thought he'd be with forever. For all that Sean lacks in intuitiveness and romantic gestures, he nonetheless is a man who thought he had it all figured out. He has the beautiful wife, the beautiful daughter, the beautiful home, and what he thought was a beautiful wife. Fen, meanwhile, knows her Sean is having a bad week. His wife not only kicked him to the curb, she did so because she is having an affair with her older professor. Out Sean goes, leaving behind his beloved daughter and the woman he thought he'd be with forever. For all that Sean lacks in intuitiveness and romantic gestures, he nonetheless is a man who thought he had it all figured out. He has the beautiful wife, the beautiful daughter, the beautiful home, and what he thought was a beautiful wife. Fen, meanwhile, knows her life is nothing but a long series of bad luck. She gets pregnant when she's still a teenager, her son has a chronic health problem, her beloved brother is missing, and her closest friend is her crusty old boss. She's also barely getting by financially, so when the opportunity comes to rent a room in her house, she takes it. The problem with starting a romance with a man who is (a) still married and (b) possibly still in love with his wife and (c) desperate to make his daughter happy is that you are setting yourself up for certain heartache. Fen knows this, but she also knows that her life has been stalled in every sense of the word for too long. There's the missing brother thing and the ill child thing, and there is also the Terrible Secret thing. So Fen needs the possibilities that Sean offers. But let's look at that title for a minute. It certainly does not imply a happy ending, does it? There is a lot of missing going on in this book. Sean misses his wife and his daughter. Fen misses her brother and her innocence. She also misses a happy, cohesive family, which Sean has, even if he doesn't always appreciate it. Watching these two come together is sweet and lovely. It will give you a little jolt of the warm fuzzies. But yet you know, you just know, that something bad will happen. Fen feels it too. Sean? He's too obtuse to notice. Remember: his wife accused him of being colossally unobservant. The "missing" of the title doesn't just refer to an emotional longing. There is a physical missing, too. Sometimes you miss someone because the timing is bad, or sometimes you miss them because you want to dodge the possibility of them before you get hurt. These sorts of missings are present in this book as well. Some of the story felt overly familiar. Louise Douglas does a commendable job giving us, in Sean and Fen, two people who make us care about them. She also, unfortunately, uses some predictable plot points. Like I said, there is a sweetness to this story, and that's thanks to Fen. She's had such bad luck for so long that you dearly hope she will see a turnaround. If anyone deserves a happy ending, it's her. Review copy provided from publisher in exchange for an unbiased review. The writing style of MISSING YOU is fascinating. Douglass goes into minute details in her descriptions. At times, the author is even surprisingly poetic. Douglas managed to escape a lot of clichés from romantic genre. Not all of them, but that would be unreasonable to expect. The plot is almost completely predictable (to me that is, it may not be to everyone). That goes for the end as well. There were a few pleasant surprises along the way, though. Characterization is decent. The characters have The writing style of MISSING YOU is fascinating. Douglass goes into minute details in her descriptions. At times, the author is even surprisingly poetic. Douglas managed to escape a lot of clichés from romantic genre. Not all of them, but that would be unreasonable to expect. The plot is almost completely predictable (to me that is, it may not be to everyone). That goes for the end as well. There were a few pleasant surprises along the way, though. Characterization is decent. The characters have their charms, for instance the language they use is very appropriate to their character. However, their actions seem too predictable- or is it just because of the storyline? I can't tell. What I liked most about the novel is that it is not just about the love story; it says something about morality, responsibility and making the right decisions. Let's face it- the only think I've against this book is its romantic genre. Perhaps it's not fair to judge book badly only on account of that. Well, we all have our preferences and I just have something against the idea “fall in love and live happily ever after". It’s too simple. I would recommend it to the fans of romantic genre. Generally speaking, it isn't a bad novel and it's easy to read. I rated this book a 3 because even though it is a lovely story and I read in in two days... it was not a story that made me feel good. Escapism is important to me as a reader! It deals with a lot of difficult issues. Adultery, separation, children with difficulties, loneliness, guilt, accidental death, trajedy... and true love. The kind of love that means something and matters. So even though it brought these difficult topics together in a very clever and unique manner it was not the kind of book I rated this book a 3 because even though it is a lovely story and I read in in two days... it was not a story that made me feel good. Escapism is important to me as a reader! So even though it brought these difficult topics together in a very clever and unique manner it was not the kind of book I would want to read again. All I could think of was of the family break ups I have witnessed and the damage it originally did for my neices and nephews. This to me was the book form of a slow-moving foreign film, maybe with subtitles, hazy imagery and 1930s dress. A lot of people would love it, but it just wasn't for me. The blurb on the book is there and accurate. It is told in 3rd person, which did nothing to endear me to the characters honestly. The beginning was especially hard with nearly no dialog and characters even thinking in third person. I found it slow moving and dull, neither character particularly dynamic or compelling to me. The w This to me was the book form of a slow-moving foreign film, maybe with subtitles, hazy imagery and 1930s dress. A lot of people would love it, but it just wasn't for me. The blurb on the book is there and accurate. It is told in 3rd person, which did nothing to endear me to the characters honestly. The beginning was especially hard with nearly no dialog and characters even thinking in third person. I found it slow moving and dull, neither character particularly dynamic or compelling to me. The writing itself was not bad, just not to my taste. It would be ideal for someone who likes their novels at a slow deliberate pacing with a gentle tone. The basic story idea was good here, but it was written in such a tedious way, I couldn't get into it at all. EVERYTHING was spelt out for the reader, there was absolutely no subtlety at all. Unfortunately, both Fen and Sean (the two main characters) were rather unlikeable, and I didn't believe in their relationship. I can see that Louise Douglas can write, and has good ideas, so I will try another of her books to see if it's any better. This was poor. Well... At first I thought this is one of those wannabe Sparks books. But at the end it was just ok. I mean, story was fine, but something was missing, something deeper to make me fall into this story. And this is, for me, one of those books where title doesn't have anything to do with story. So, I'm giving you 2 stars. It was a good read although I did find it a bit slow to get into! Loved the characters but wish she had expanded it more at the end! This was an 'ok-ish' type of book. I don't feel enriched after reading it and was mildly frustrated by some of the characters. There's a lot of repetition throughout the book and certain themes are not explored deeply enough. I felt the author skimmed the surface. This would be ok as a holiday read. Missing You by Louise Douglas is a typical romance novel with a very small mystery (not really) element. Sean comes home from work to find his wife waiting for him at the door with his belongings. She wants him to move out. They have been married for eleven years and have a daughter named Amy. Belle has met and fallen in love with another man (an older man who is a writer). After staying in tacky motel rooms, Sean is told about a room to let by his colleague, Lina. Fen Weller lives on her own wi Missing You by Louise Douglas is a typical romance novel with a very small mystery (not really) element. Sean comes home from work to find his wife waiting for him at the door with his belongings. She wants him to move out. They have been married for eleven years and have a daughter named Amy. Belle has met and fallen in love with another man (an older man who is a writer). After staying in tacky motel rooms, Sean is told about a room to let by his colleague, Lina. Fen Weller lives on her own with her son, Connor. Connor has mild cerebral palsy. Fen works in a bookstore called The Gildas Bookshop. Fen is constantly looking over her shoulder and does not live her life to the fullest. She has put her life in a holding pattern since an accident occurred ten years ago. She needs more income so she decides to rent out her extra room. The room used to belong to her brother, Tomas. Fen has not seen Tomas in years. He has a drug addiction. Sean moves into Fen’s room and the two start to slowly get to know each other. Sean has to come to reality that his wife, Belle has moved on with her life and so must he. Just when things are working out between Sean and Fen, Belle starts calling. Belle has broken up with the Other (as Sean called her boyfriend). Belle now wants what she cannot have. Belle keeps calling needing help and then she takes too many pills. Sean is forced to go back to his old home and help her out. Sean feels he needs to be there for their daughter, Amy. But is this what he really wants? Fen has to face up to what happened ten years ago. Fen cannot move on with her life until she acknowledges what happened and makes things right. Will Sean and Fen get back together? What happened with Fen ten years ago? When I picked this book, I thought there would be more mystery in it. The so-called mystery or secret that Fen was keeping was so easy to figure out. I knew what the ending of this book would be as soon as Fen decided to let her extra room (British novel). I give Missing You 2.5 out of 5 stars. It was just an okay book. It was nothing new or exciting or different (I need to be more careful when picking books)! If you are looking for a romance book, then you will enjoy Missing You. If you are looking for something more, than this is not the book to read. Missing You was nicely written and the flow was not bad. I felt that there were some areas that could have been left out completely and would not have made a difference in the story. I received a complimentary copy of Missing You from NetGalley in exchange for an honest review. The review and opinions expressed are my own. Fen hasn't had it easy, which is why she prefers to lead a quiet life together with her son Connor. She enjoys her job working in a local book shop, but mainly keeps to herself the rest of the time, afraid getting close to other people will only hurt her in the end. Sean is lucky enough to have everything he ever wanted in life: a great job, a beautiful wife, and a wonderful daughter named Amy. But then Belle suddenly reveals she has been seeing someone else and wants a divorce. Before he has time to even think about it, Sean finds himself looking for a place to stay which brings him to Fen, who is looking for someone to rent one of her spare rooms. As time passes, Fen and Sean slowly build up a friendship and there might even be more between them. But will everything that happened to them in the past prevent them from being able to love again or can they overcome their struggles and finally lay the past to rest...? 'Missing You' was actually released for the first time in 2010 and I was lucky enough to receive a review copy of the 2015 re-release by Bookouture. I was quite blown away by Louise Douglas' writing and how she managed to create a very specific atmosphere in the book, which fit the mood and experiences of the characters perfectly. Fen and Sean have both been through some difficult times and this feeling of sadness reflected really well in the writing, while also shaping the characters. I liked both Sean and Fen straight away and was really rooting for them, keeping my fingers crossed for a happy ending for the both of them. This review has been hidden because it contains spoilers. To view it, click here. First, let me say I received a copy from Net Galley in exchange for an honest review. I read Louise Douglas' other book, The Love of My Life and I have to say I enjoyed that much better. I hate to be rude about any book, and I try to keep it professional, but I rolled my eyes so hard during so much of this book, I gave myself a headache. This book was way too predictable for my liking. I can sum it up in a few seconds. Fen (!) has a secret involving her brother many moons ago. She also has a son First, let me say I received a copy from Net Galley in exchange for an honest review. This book was way too predictable for my liking. I can sum it up in a few seconds. Fen (!) has a secret involving her brother many moons ago. She also has a son with cerebral palsy named Connor. They live alone, because Connor is the result of a one night stand and Fen has trouble making ends meet. She takes on a house mate for rent...enter Sean. Sean is reeling from a breakup from his wife, Belle, who left him for another man. Sean leaves the family home and rents a room in Fen's house, bringing his daughter Amy over for visits. I am sure you can gather what happens. I was reading this book on a Kindle and I kept looking down to see how much of a the book I was finished. I was stunned when I saw I had 60 percent of the book left when, to me, the whole thing was already explained and on an obvious path. Anyway, NONE of these characters were likable, EXCEPT little Connor. Fen got on my nerves the worst...such a martyr. In her opinion, she didn't "deserve" Sean and she "bit her lip" so often in her overwhelming insecurity, I thought she was going to need stitches. However, worst of all, at some points I thought I was reading some kind of Fifty Shades of Grey novel (which I haven't read, but know what it is about, thanks to all my friends). I was wondering why the author felt the need to be so explicit. Finally, I don't know who is designing Louise Douglas' covers, but in my opinion they don't fit the couples I am imagining in my head. Missing You opens as Sean returns home, flowers in hand, to try and save the marriage he had thought was perfect but his wife had not. He is sent packing nonetheless. With nowhere to go, a colleague arranges for him to lodge with Fen, a female friend of hers. The story then follows Sean’s struggle to move on from his separation, becoming more than a lodger in the process. I’ve read many break-up stories from a woman’s perspective and I admire Louise Douglas for tackling that of a man’s. The story Missing You opens as Sean returns home, flowers in hand, to try and save the marriage he had thought was perfect but his wife had not. He is sent packing nonetheless. With nowhere to go, a colleague arranges for him to lodge with Fen, a female friend of hers. The story then follows Sean’s struggle to move on from his separation, becoming more than a lodger in the process. I’ve read many break-up stories from a woman’s perspective and I admire Louise Douglas for tackling that of a man’s. The story seems to have bypassed many of the clichés found in the romance genre. It’s not formulaic and characters aren’t airbrushed. They’re human with all their flaws. I particularly liked the way Sean and Fen grow into their true selves as their rebound relationship blossoms into something more. I wondered why Sean stuck so long with a wife who’s clearly confused about what she wants and I wished her every comeuppance for having an affair rather than talking to him about her issues. Description is spot on in Missing You and sometimes loaded with meaning, like when Sean’s flowers are rejected by his wife during the opening: “The cellophane crackles and two petals fall at his feet”. Interestingly, there’s not an awful lot said about what some of the characters look like but I quite liked roaming free with my imagination and it’s probably one of the reasons this romance feels so fresh. Despite the shadows caused by the breakup, there is a lot of light in this novel too, particularly when Sean becomes drunk after a difficult conversation with his wife and gets in a pickle with a loo, a towel and a bread bin. Added to this, the courage some of the characters have to embrace their responsibilities in spite of their pain makes Missing You surprisingly uplifting. Sean’s seemingly perfect life crumbles when his adored wife Belle throws him out to start a new life with the Other. Sean had no idea of his wife’s unhappiness and struggles to cope without her and his young daughter, Amy. He rents a room in a house with Fen and her little boy Connor. Fen leads a secluded life based on work and the care of her boy. She’s moved away from family and friends to hide a guilty secret involving her brother. Both characters have difficulties in moving on but circumstan Sean’s seemingly perfect life crumbles when his adored wife Belle throws him out to start a new life with the Other. Sean had no idea of his wife’s unhappiness and struggles to cope without her and his young daughter, Amy. He rents a room in a house with Fen and her little boy Connor. Fen leads a secluded life based on work and the care of her boy. She’s moved away from family and friends to hide a guilty secret involving her brother. Both characters have difficulties in moving on but circumstances bring them together and they begin to find some happiness. Beautifully written and wistful – I loved it! I had previously read The Love of My Life by this author and enjoyed it so much that I wanted to read more from her, when I saw this eBook on Amazon at a great price I couldn’t resist. The beginning set the scene well, there was an overall feeling of sadness throughout the book and to see Sean’s heartbreaking situation so early on instantly made me feel sorry for him. Fen was very nervous about something and repeatedly mentioned Tomas and Joe, at that point I had no idea who they were and I made I had previously read The Love of My Life by this author and enjoyed it so much that I wanted to read more from her, when I saw this eBook on Amazon at a great price I couldn’t resist. The beginning set the scene well, there was an overall feeling of sadness throughout the book and to see Sean’s heartbreaking situation so early on instantly made me feel sorry for him. Fen was very nervous about something and repeatedly mentioned Tomas and Joe, at that point I had no idea who they were and I made a couple of predictions which ended up being totally wrong. The pieces of that particular puzzle were fitted together gradually and this was one of the things that kept me flipping the pages. Sean and Fen were brought together quite randomly, I enjoyed the fact that their relationship wasn’t rushed because it made it feel more natural and believable. They faced plenty of ups and downs and I have to admit that I wasn’t entirely sure how their relationship was going to end. One of my favourite moments in the book was Sean’s drunken night out, it was fun to read and had me laughing out loud as the authors descriptions of everything were so precise, it enabled me to visualise the scene easily! The author also described the intricacies of relationships beautifully, I particularly enjoyed reading from Sean’s side about his marriage breakdown. I’ve read many books about women being left by their men and the effect it has on them but rarely have I read a book that tells it from this point of view, for me it made the story feel fresh and different. I really enjoyed this book, I tend to read a lot of books that are fast paced and it was lovely to read a book that is at a slower, gentler pace.. This book is a lovely story about the two main characters Fen, single mum of Connor, and Sean who has just found out his wife has been having an affair. Sean having to leave the family home chances upon a room that is for rent in Fen's home. As the two become more familiar with each other their relationship grows into more than a land lady and a lodger I really enjoyed this book, I tend to read a lot of books that are fast paced and it was lovely to read a book that is at a slower, gentler pace.. This book is a lovely story about the two main characters Fen, single mum of Connor, and Sean who has just found out his wife has been having an affair. Sean having to leave the family home chances upon a room that is for rent in Fen's home. As the two become more familiar with each other their relationship grows into more than a land lady and a lodger. As always though, nothing is that simple. Fen has a guilty secret from her past and Sean's ex, Bella, threatens to break up the happy couple. There is a sense of a will they won't they going through out the book and I honestly thought I knew how it was going to end. Have got to say I loved the ending and was glad I had guessed wrong. The characters were all very strong in their roles even though some didn't appear in the story much. I loved Sean's sister in particular and I really cared for Fen and Sean and am quite sad now that the story is over. Missing You is the first book I have read by this author and I certainly look forward to reading more by her. A tale of two dysfunctional souls, Fen and Sean, who meet as Sean becomes Fen's lodger. Both have children, both are damaged and both need each other. It is Sean's story that dominates first- as we see the breakdown of his marriage as his wife, Belle, coldly confesses to an affair (with 'The Other') and requests Sean leave the family home and find somewhere else to live. Heartbroken and disbelieving, Sean rents a room in Fen's house and slowly but surely stops pining for Belle, while he strikes A tale of two dysfunctional souls, Fen and Sean, who meet as Sean becomes Fen's lodger. Both have children, both are damaged and both need each other. It is Sean's story that dominates first- as we see the breakdown of his marriage as his wife, Belle, coldly confesses to an affair (with 'The Other') and requests Sean leave the family home and find somewhere else to live. Heartbroken and disbelieving, Sean rents a room in Fen's house and slowly but surely stops pining for Belle, while he strikes up a new tentative relationship with Fen and her son Connor. Slowly, Fen's story emerges- there is something in the past about a lost brother, Tomas, and the death of his friend Ben. And the story has stopped Fen from having a relationship, seeking her own personal happiness. Until she met Sean. Their story together is complicated, and as a reader I wanted it to end happily ever after. However, somehow, I was left cold by the characters. Unlike in 'The Love of my life', here, Louise Douglas' characters aren't quite as well structured. Both of them seemed fairly ethereal and fluid to me, and for that reason while the book interested me it didn't draw me in as I hoped it would. Nevertheless an eminently readable tale. This is the story of two lonely people, one with a stressful past, and the other with a difficult current situation. Each has a young child. The story switches between their viewpoints, charting their growing friendship and more. There’s not a whole lot of plot; the mystery surrounding the past isn’t as terrible as it might have been; the issues in the present are resolved, more-or-less. The book is primarily about coming to terms with the past, and the need for honesty, while making wise decisi This is the story of two lonely people, one with a stressful past, and the other with a difficult current situation. Each has a young child. The story switches between their viewpoints, charting their growing friendship and more. There’s not a whole lot of plot; the mystery surrounding the past isn’t as terrible as it might have been; the issues in the present are resolved, more-or-less. The book is primarily about coming to terms with the past, and the need for honesty, while making wise decisions and moving forward. I liked the main female character, and thought the scenes with the children worked well. It was harder to like the male protagonist, who is a stereotypical beer-swilling insensitive guy; yet he’s very attached to his daughter, and gradually learns more about himself and those he cares for. The conversation is believable, if a bit trite in places, and the writing is good. Overall, I thought this an enjoyable read, difficult to put down by the time I was half way through, although there was more bad language than I’m comfortable with. The ending was positive and hopeful, albeit predictable and rather too abrupt. I finished this on my train journey today and heaved a sigh of relief that Louise Douglas has come up trumps again, although I do think I preferred The Love of My Life, this one really is another excellent read. I was absorbed by the story from page one and fell in love with Sean straight away - Douglas certainly can draw some wonderful characters, both Sean and Fen were very realistic, if somewhat flawed in places - but hey, how many of us arent? The story develops alongside the budding relations I finished this on my train journey today and heaved a sigh of relief that Louise Douglas has come up trumps again, although I do think I preferred The Love of My Life, this one really is another excellent read. The story develops alongside the budding relationship between Sean and Fen with other characters being introduced along the way. The two children are great and I loved Sean's sister Lola! I liked the fact that the story is written in the third person, giving the reader the opportunity to see the story from all angles. There is a darkness about the story with references to things in the past, and I'd agree that at times it was maybe just a little far-fetched but this doesnt detract from some really emotive writing. I found Missing You very different from the 2 newer books by Louise Douglas. In Her Shadows & The Secrets Between Us were gripping & kept me guessing & flipping. Missing You was a tad more 'realistic'. I'm puzzled if her brother passed or not & if his missing, or even death, really I found Missing You very different from the 2 newer books by Louise Douglas. In Her Shadows & The Secrets Between Us were gripping & kept me guessing & flipping. I'm puzzled if her brother passed or not & if his missing, or even death, really impacted the storyline though. I did wonder Why not let him appear? Or why not let his body be found? Also Belle, I had thought her enlightenment towards the end was unrealistically abrupt. Could have given her a terminal illness... maybe or something? It was too easy for Sean to convince her. But that's my personal opinion. Overall, I love it. It was an easy read & I'm going to hunt for Louise first book now. Hope I can find it!